Last night I was making super rich and heavy quinoa-coated potato croquettes and wanted a dense earthy bottle to accompany them. 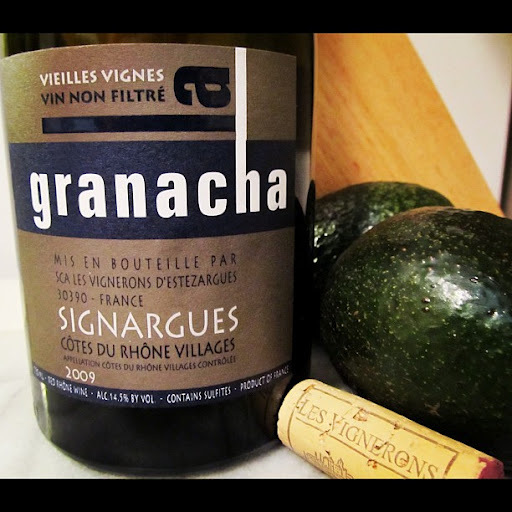 I emerged from my wine bar with a bottle of Les Vignerons Signargues La Granacha 2009. Whilst a French bottle, it was named Granacha as a nod to the Spanish origins of the Grenache grape. Unfiltered and vinified using all natural yeasts; the grapes were sourced from nearly 100 year old Grenache vines on select sites. Signargues is a plateau in the most southern Cotes du Rhône Villages appellation, situated between 4 vineyard communes. Up until 2005 the appellation for the 4 communes was Cotes du Rhône Villages, but now the term Signargues is utilized. After aerating there was still an obvious alcohol smell, so I let it rest for about 30 minutes in my glass. Dark purple with violet highlights in colour, aromas of chocolate and herbaceous notes now twined about in my glass. Fruity and dense flavours of blackberry and black current were underscored by earthy, forest elements in the full body. Spicy black pepper and rich dark chocolate elongated the velvety finish. With an alcohol content at nearly 15%, this is a big, bold, dark, fruity, contemplative glass that empties quite faster then you will anticipate.